But even that last story ended with the caveat that Microsoft still wasn’t releasing the Windows 10 October 2018 Update to everyone. The company had to resolve lingering problems with the update, meaning that even though it was re-for-the-umpteenth-time-released in December, it wouldn’t even arrive in its namesake year. Now, though, we'll see how long it takes to roll out to everyone automatically. Hopefully that puts it to rest. I am not sure if this is real news or fake news as there is no link to a supporting document. I got this 1809 update automatically on my Z170 and HM87 systems back in November and it worked fine. Perhaps Microsoft just delayed updating whatever doc is referenced? They did start an automatic rollout several times, and had to cancel it when some (not all) of the earliest users reported problems immediately after the update. You may have been in one of the early groups. They also tailored the initial rollout to groups that had hardware known to be more compatible, avoiding groups that could have experienced the bug, until they had enough tests to confirm that it was fixed. I did not get my 1809 until I forced a "Check for Updates" a few weeks ago. Renaming a major update - possibly multiple times - would be stupid; it would only cause confusion. "Why can't I apply the 2019 January update? Oh, it's actually the 2018 October update that has been renamed, and I already have it installed..."
Some people actually got it back in Oct/Nov 2018, if they chose to update manually. I did on both my computers, and had no problems. I guess the public beta test is over. IDEA: Rename these to when they start publicly testing it out. It's the October 2019 Update guys... if Microsoft delays a bit longer! *Seriously though, do NOT manually update unless you have a major issue you KNOW the update fixes. And setup an automatic image backup using a tool like Acronis True Image... my PC stopped booting after exiting Safe Mode and even the REPAIR tool would not work. I restored an earlier Acronis point from two days ago and got back to work. Nate, you're getting rather obsessive in your hatred of Microsoft. I've had the Build 1809 on all our PC's for weeks and its quite terrific. Perhaps you have "father issues?" Get a grip. Relax. It's all going to be "OK."
I had a problem with the Windows updates last year. It crippled my System : AMD Ryzen 3 2200G processor with Radeon Vega graphics, Windows 10 64 bit OS, Gigabyte AB350M Mobo, 8GB RAM. I had to uninstall the updates in Safe mode. Since then I am weary of the Windows October 2018 updates. Windows 10 is just not well suited for machines that have any kind of custom services for business installed unless you like tracking down all of the software which fails to migrate for undisclosed reasons at every biannual update. Just had to deal with a machine that received the 1809 update last Friday. The absolute and only thing the owner knows that he received from the update was a need to have printing on one of his machine restored. The printer wasn't uninstalled, it migrated fine. The printer port, a standard virtual printer port for USB provided by Microsoft, was not migrated, so the printer could only be used in offline mode, and finally the custom software that his printer needs to handle print jobs also failed to migrate. Where is the value in the 1809, or any of the previous updates for this customer? For business machines, most if not all of these feature pushes are pretty useless and can be guaranteed to be as trouble free as having a mechanic take the engine in your car apart twice a year and then reassemble it. For a machine that is otherwise fine, all you're doing is increasing the chances of something unwanted happening to it. Is part of this nonsense about breaking machines to drive future sales? 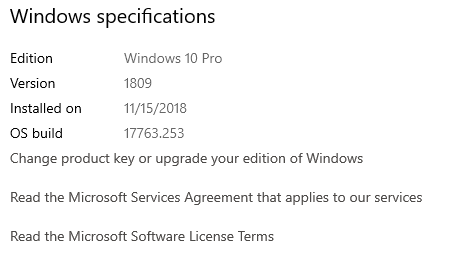 So the obvious question; for the average user, is 1809 finally safe to install? Even by Microsloth Windoze standards this version has been a nasty beast. I understand that one of the improvements is to REMOVE Windoze Backup - the tool that made it easy to do a full image backup? So when the next update or even monthly bug release trashes your PC, you'll no longer have an image backup to work with unless you have found another tool. And I've yet to find another tool that actually, consistently, easily works. The simple answer is no, the 1809 biannual update is not safe to install, and more generally, none of the biannual Windows updates can be considered 100% safe to install, at least not until the process changes. The biannual updates consist of a re-installation of Windows, followed by a migration process that often fails to migrate all user software and settings from the previous install, and finishes without informing the user which software failed the migration process.